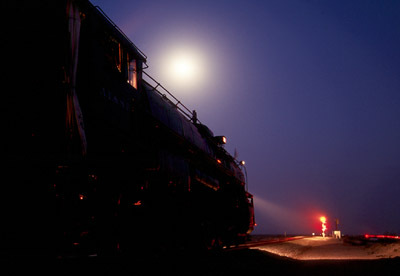 This page has been created to combine a growing interest I have acquired for night railroad photography. My first attempt at night shooting came from a run to downtown Las Vegas to catch the UP 2002, one of the specially painted SD-70's for the Salt Lake City 2002 Olympics. I had not had a chance to see either of the two Olympic units and when I found out that 2002 was on her way through town I was really excited. Only one problem, she was due through about midnight. I resolved to follow the train from just north of town to the crew change and at least enjoy seeing the train. Once at the crew change I figured what the heck and broke out my camera for my first attempt at a night shot. Leaving the camera in a fully automatic exposure setting, I set it up on my tripod, manually focused the shot, and let her rip. The result were amazing. Not only did I get the shot I wanted, I realized that I had opened to myself a whole new venue in which to shoot trains. Subsequent trips proved valuable to my attempts and I realized that I was opening myself up to some nice possibilities. I'm not going to get into a lot of technical details and settings for the various shots presented below, but suffice it to say, I generally let the camera figure the exposure time and all I do is focus. I do count the seconds and most images are shot at between 10 and 20 seconds. I also use only 100 speed slide film, Sensia or Astia as the norm. I have found that getting a longer exposure time tends to better the image and shooting around some alternative light source is better than complete darkness. Anyway enough rambling, here's what I have so far, broken up by railroad... Click on a Thumbnail to View larger image. * after thumbnail denotes image added at latest update given above. All Images are copyrighted. Use for profit by permission only.